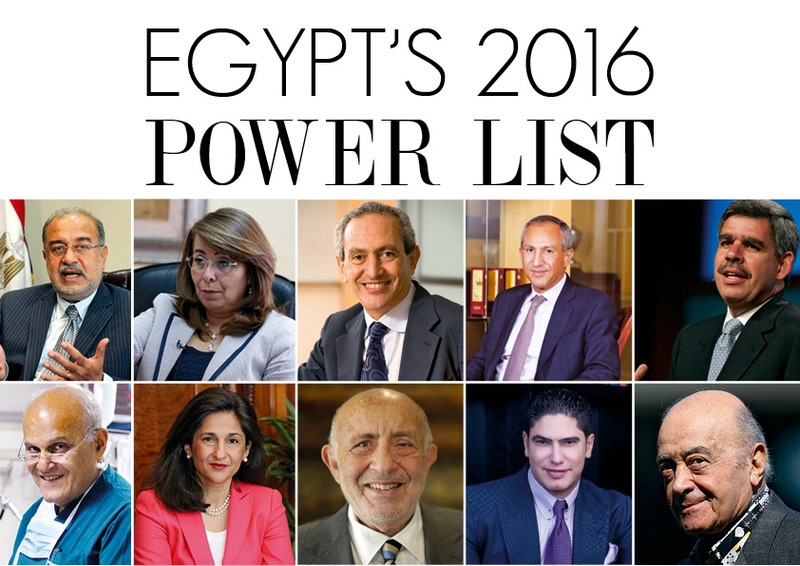 Even though it’s harder than ever to determine the people with the biggest influence in today’s Egypt, we did our research once again to prepare our annual Power List. From government officials to industrial tycoons, to prominent Egyptians outside Egypt, here’s a guide to the Egyptians who run the government, power our businesses and shape our country. Egypt’s former minister of petroleum, was appointed Prime Minister by President El-Sisi in September 2015. As the second most powerful political figure in the country, Ismail has focused on implementing solutions to Egypt’s socioeconomic challenges. Sobhy became Minister of Defence in March 2014 after Abdel Fattah El-Sisi resigned to become president. Like his predecessors, he heads the Supreme Council of the Armed Forces and is tasked with strengthening the nation’s military and protecting the country from terrorism. A career diplomat whose last ambassadorial posting was in the United States, Shoukry briefly retired before being appointed Egypt’s Minister of Foreign Affairs in June 2014. Since then, Shoukry has had to delicately mend relations with other countries in the midst of the country’s continuous socioeconomic turbulence. Abdel Ghaffar was appointed Minister of Interior in March 2015, and was tasked with policing the country and protecting citizens against crime and terrorism. He oversees the Central Security Forces, the National Police, and the Egyptian Homeland Security. El Garhy was appointed Minister of Finance in March 2016 to help solve the country’s financial crisis. Having previously held the positions of deputy CEO of the Qatari Ahli Bank and board member of Qalaa Holdings, he is tasked with reducing the government’s large budget deficit through raising revenues and reducing expenditures. Formerly the Vice President and Group Treasurer at Orascom Construction Limited, Khorshid is the first female Minister of Investment in Egypt. She was appointed in March 2016, and is responsible for creating an attractive business environment to encourage foreign and local investments in Egypt. Appointed minister in September, 2015, Nasr is a former professor of Economics at the American University in Cairo and former World Bank official. As minister, Nasr has sought to develop financial agreements with donor countries and international organizations to help spur economic development. Appointed minister in March 2014, Al Araby is now entrusted with laying out plans for Egypt’s economic and social development. Al Araby has held the same position before, under three different cabinets. A former partner at Abraaj Capital, Kabil was appointed in September 2015. Since then, he has focused on big industrial projects like the Damietta Furniture City and the Pharmaceutical and Cosmetic Industrial Complex in Bany Souef. Madbouly was appointed Minister of Housing in February 2014, after having held several senior posts in the ministry. He has been working to provide new housing opportunities for low and middle class citizens. Previously Secretary General of the Social Fund for Development, Wali was appointed minister in March 2014. She has been instrumental in expanding the social programs that benefit the poorest families in Egypt. Amer was appointed Governor of the Central Bank of Egypt in November 2015 after previously serving as deputy governor. With 27 years of banking experience, he now oversees Egypt’s banking sector and is responsible for the country’s monetary policy. As the CEO of OCI, Sawiris has become Egypt’s richest businessman. OCI is a leading global engineering and construction contractor, primarily focused on infrastructure, industrial and high-end commercial projects. Sawiris partnered with Abu Dhabi’s International Petroleum Investment Co. to develop a coal-based power plant in Egypt in 2014. Sawiris is the billionaire founder of Orascom Telecom and the founder of the Free Egyptians Party. He has numerous investments in Egypt and around the world via his holding company, Weather Investments. Mansour is the part owner of Mansour Group, a family business empire and one of the largest private sector conglomerates in the Middle East and Africa. Mansour is closely involved in the consumer goods division of the group, which includes the many brands he created such as Metro supermarket chain, Labanita and Hayat water. Mansour is the part owner and board member of Mansour Group, one of the largest private sector conglomerates in the Middle East and Africa. Mansour Group represents global brands, including Caterpillar, General Motors, Chevrolet, McDonald’s and many more. Mansour is a part owner and Vice Chairman of Mansour Group, a family business empire and one of the largest private sector conglomerates in the Middle East and Africa. He is also the Chairman of Palm Hills Developments and the founder of Manfoods. Sawiris founded Orascom Development, which builds and operates resorts in Egypt, Montenegro, and Switzerland. In January 2015, the company sold 15% of its subsidiary, Orascom Hotels & Development, on the Egyptian stock exchange. Sawiris also owns nearly 10% of construction giant, Orascom Construction Industries. El Chiaty is the Chairman and CEO of Travco Group International Holding, the most prominent travel group in the Middle East and North Africa. The company owns Steigenberger Hotels, AG, among numerous touristic establishments in Egypt and around the world. With a net worth of over USD 340 million, Ahmed El Sewedy is the 71st wealthiest man in the Middle East. Along with his brother Sadek, Ahmed runs Elsewedy Electric Company, an Egyptian manufacturing conglomerate that sells integrated energy products and services in seven energy segments. Sadek El Sewedy is the Chairman of Elsewedy Electric Company, the leading cables and electrical products manufacturer in the Middle East, with a speciality in providing integrated energy solutions in sections such as wires & cables, transformers, telecommunication, energy management, turnkey projects, electrical products and wind energy generation. Ghabbour is the chairman and CEO of GB Auto. GB Auto is the leading automotive assembler, manufacturer and distributor in North Africa and the Middle East. Khamis established Oriental Weavers Group in 1978, which is now one of the largest manufacturers of carpets in the world. The group has manufacturing facilities in three countries and distributes its products to more than 130 countries worldwide. As Chairman of Elsewedy for Electrical Solutions, El Sewedy manages the leading manufacturer of integrated cables and electrical products in the Middle East, providing integrated energy solutions to a diverse range of sectors. As the founder of Amer Group Holdings, Amer is responsible for the numerous ‘Porto’ real estate developments in Egypt’s North Coast, Cairo and Sokhna, which are some of the most successful developments in Egypt. The group recently signed an agreement with Arabtec Construction, one of the leading construction companies in the UAE, to establish a new joint venture. Prior to founding LCP in 2015, Zaki founded and managed Gaston Capital, a boutique investment bank focusing primarily on advisory and capital-raising transactions in the MENA region. With Zaki at the forefront, Lorax has developed an unmatched track record of sourcing, executing, and managing transactions, with over USD 46 billion in combined transaction value administered to date. Abou Hashima is the majority shareholder in Egyptian Steel, which owns several iron and steel factories. Recently, Abou Hashima acquired shares of satellite TV channel, ONTV, as a startup plan to elevate his recently founded company, Egyptians’ Media. Heikal is the co-founder of Qalaa Holdings, the leading investment company in Africa and the Middle East with USD 9.5 billion in investments under their control. He was previously the Managing Director of EFG Hermes Holding Co.
As the co-founder & MD of Qalaa Holdings (formerly Citadel Capital), a leading investment firm in Africa and the Middle East, Khazindar is is one of the leading investment bankers in the country. Qalaa controls investments in excess of USD 9 billion in industries that include mining, energy, logistics, agri-food and building materials. Through three decades as Egypt’s leading advertising agency, Nour Holdings has expanded to become the largest marketing communications group in the Middle East. In 2008, the company completed a high-profile merger with DDB Communications that allowed it to maintain a firm grip on the market. Nour is also the owner of the TV channel, Al Qahera Wal Nas. Sallam is the oldest son of the founder of Olympic Group, Abdallah Sallam. Sallam now runs the family business as Chairman of Olympic Group. The companyoperates mainly in the field of domestic appliances and over 98% of the products sold by the group are manufactured in their own production facilities. Diab is the founder and chairman of PICO, the largest agricultural producer in Egypt and has large investments in oil, gas and the hospitality sector. In 2004, he established the first leading independent Egyptian newspaper, Al Masry Al Youm, which is one of the country’s most influential publications. Saad is the son of Sami Saad, the founder of Sami Saad Holding-Samcrete. Samcrete is an integrated engineering, construction and development company for the public and private sector, which cooperates with leading global companies. Under Karim’s leadership, Samcrete is now currently working on Pyramids Heights, a landmark project at the heart of 6th of October city. Since 2002, Ezz Al-Arab has served as Chairman and Managing Director of CIB, Egypt’s largest private sector bank. With over 187 branches across the country, CIB manages over LE 187 billion. As co-founder and chairman of Beltone Financial, a leading regional financial service institution, Saba ensures that the company’s investments, asset management, and equity research are up to international standards. He’s also a co-founder of Hermes Financial, which has grown to become a leading investment bank in Egypt. Karim Awad is CEO and a board member of EFG Hermes, the leading investment bank in the Arab world, with operations in eight countries serving regional and global clients. As CEO of EFG Hermes, Awad manages a total worth of EGP 14.2 billion in company assets. Dorra has reshaped and restructured Dorra Group since taking over from his father, Mohamed Dorra. Dorra’s latest project includes the expansion of the Capital Business Center in Sheikh Zayed. Darwish served as Egypt’s minister of administrative development from 2004 to 2011 and now chairs the General Authority for the Economic Zone of the Suez Canal. Dr. Darwish supervises the authority’s plan to govern an area of 500 square kilometres around the canal cities of Suez, Port Said, and Ismailia. Al Amin owns the popular and influential CBC group of channels, which air everything from general entertainment to political talk shows. He also owns El-Watan newspaper, one of the leading newspapers in the Egypt. Abou El-Enein is the founder of Cleopatra Group and has expanded the Group’s development in manufacturing, agriculture, real estate, mega-malls and the hospitality industry. He is also the owner of El Balad Channels Network, under the branch of Cleopatra Media, a subsidiary of Cleopatra Group. The controversial owner of Galala Development Company has made a name for himself in the country through various large-scale investments in projects such as Al Ain Bay. He’s also the president of Nile Communications and Ringo Communications. El-Erian is the Chief Economic Adviser at Allianz SE, the leading international service provider, which offers products and solutions in insurance and asset management to over 75 million customers worldwide. El Erian is the former CEO and co-chief investment officer of PIMCO. The 2030 Development Agenda forms the new global development framework anchored around 17 Sustainable Development Goals (SDGs) with a total of 169 targets covering economic growth, social development, and environmental protection. Nemat Shafik became the first-ever female deputy governor of the Bank of England in August 2014. Often dubbed ‘the most powerful woman in London’, Shafik was also recently included in Forbes 2016 Most Powerful Arab Women list. In the 1st of September, 2017, Shafik will become the first director of London School of Economics. Al Fayed is a business tycoon who owns The Hotel Ritz in the heart of Paris, which is ranked among the most prestigious and luxurious hotels in the world. He has recently turned his attention to online retail, buying U.K.-based discount fashion website, Cocosa, and a controlling stake in Princess. Chairman and CEO of his own money management firm, Fayez Sarofim & Co., Sarofim specializes in long-term investment and portfolio management for leading companies. Sir Magdi Yacoub is a pioneer of heart surgery and a professor at the National Heart and Lung Institute and the Imperial College of London. He founded Chain of Hope Foundation and the Magdi Yacoub Foundation Heart Centre in Aswan, which offer free health services and heart surgeries of the highest standards to the underprivileged. Allam Marine, in Melton, is a global manufacturer and supplier of generators. In 2006, he was awarded the United Kingdom’s Queen’s Award for Enterprise and was named the Ernst and Young UK Entrepreneur of the Year. In addition, Allam owns and chairs the professional Hull City Association Football Club, based in Hull, England. With over 25 years of experience in investment banking, Abdel Meguid is a power house in the finance world and has helped PWP become a leading independent global financial services firm. Abdel Wadood is responsible for overseeing the investment activities in the Middle East, South Asia, and North Africa for the Abraaj Group, which currently manages USD10 billion across targeted private equity strategies. Hatem Dowidar was appointed CEO of Etisalat International in June, 2016, and now runs one of the world’s leading telecom groups, providing innovative solutions and services to 163 million subscribers in 17 countries across the Middle East, Asia, and Africa. Prior to joining Etisalat, Dowidar was the chief of Vodafone Group in London.